Rejection never felt so good! 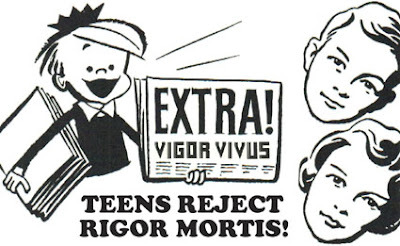 But today it was heavenly, as I personally witnessed a roomful of teenagers reject the Rigor Mortis lifestyle for that of Vigor Vivus. I was nervous going in, knowing I had the truth but not knowing how they would respond. The way I remember teenagers -- and maybe it's mostly my imagination -- they're a bunch of idiots who will reject anything good for them in favor of the detrimental. But I was pleasantly surprised to see them give rapt attention to my teachings and celebrated the good choices they made. This was a Sunday School class, I should say that going in, because of course in Sunday School you're going to get the kids who are more likely to seek the good. They're not just hanging around on street corners, cigarettes rolled up in their T-shirt sleeve, spitting in gutters, and breaking windows. They've already got enough idealism in them that you can have hope for the future, not like the kids I've seen standing in front of the tattoo shop, one leg up against the building, sunken chests, bloodshot eyes, dumb grins, yellow fingers, who run like scared cats any time an adult approaches them. If it weren't for the Vigor Vivus lifestyle -- the life of confidence, optimism, believing in yourself and higher things, and rejecting the difficulties of the Rigor Mortis way -- I might very well find myself filled with despair, I'm sure I would. If you can overcome that, you're miles ahead of the rest. Of course I still have a great deal of sense. If it were a matter of trapping some of these teenagers at the tattoo shop and trying to deprogram them, I'd naturally want to use every means of preventing the spread of infectious disease. They'd have to be clinically deloused and scanned with one of those black lights that reveals germs. Fortunately, the kids at church have been raised in a more proper way. Their parents aren't wolves in the forest, running wild and fighting over a piece of raw meat. They're not ferreting through public ashtrays looking for half-smoked ciggies. They're not rocking ATMs. Instead, they're responsible, taking care of their families, budgeting, and shunning evil. That's the way I was raised, and, look, I turned out pretty darned good, if I do say so myself. I shudder when I think how it might've been if I'd been raised by these losers, I'd definitely be living the Rigor Mortis lifestyle. I'd probably be in prison, where I would belong. But we're trying to turn out good kids. It's the best thing. It's the only Vigor Vivus choice! So today my report is that Sunday School went great. I opened with the thing about the zombies, staggering around in Rigor Mortis, and I explained, like I said I would, that there are a lot of "dead men walking." I used the example of Adam and Eve, just like I said I would, and we were off. All that, of course, constitutes Rigor Mortis, springing out of the choices we make and what we settle for. I got them to name names, too, kids they knew from school or the neighborhood who are into Rigor Mortis. I jostled their memory by specifically mentioning the tattoo shop, as above, and that brought out a few knowing chuckles. It was at this point that a couple of boys in the back thought they would do some cutting up. They used some phrases and language that indicated that they thought that lifestyle was pretty cool. I looked out and saw some other smiles and knew that if I didn't stanch it right there, the others would slide off the deep end. I looked at them with a stern look, yet one that was filled with compassion; I had direct eye contact, and that always makes a recalcitrant little squirt squirm. No smile, just a compassionate sternness. I said that was the way of death, the way of Rigor Mortis, but we have a better option, which, to get them on my side I said, "Most of you are following it, even if you don't realize it," the way of Vigor Vivus. A little praise primes the pump. Not to rehash every single point, I made the points about Vigor Vivus from my blog, and held up some pictures of well-known athletes. While not endorsing everything about their lifestyles -- especially Tiger Woods -- I said there were indicators, sometimes fleeting, of Vigor Vivus in their lives. Such as the confidence to get things done, the wherewithal to stick to a task, the alertness, drive, optimism, etc. You can see I'm excited, that's why I'm going for all the synonyms I can think of. Word of advice, Don't get me started! LOL! The class settled down immediately after that one disruption, and I went from one victory to another with them, receiving commitments from each one that they'd practice the Vigor Vivus way. And for that, I'm very thankful. How About You? -- They say life doesn't come with instructions. That's not true. The instructions are written clearly in our hearts, even if not in words. There is the way of death and there is the way of life. Death is an end, an end that we can submit to all along the way. That's the way of Rigor Mortis, which hardens us, slows us down, and in the end literally stiffens us to the point that we are no good, we are dead. So many people have chosen that way, not just teenagers, even old timers like me. But the way of life is also before us. And we can submit, rather, share in, the way of life all along the way as well. That is the way of Vigor Vivus, which keeps us supple, allows us to advance, to progress, and all along the way to raise our good cheer to levels that increase, eventually beyond anything we had imagined. We are alive, alive, alive -- fully alive. That is something we can choose, too. That is something you can choose today, to live ... the Vigor Vivus way!